Autograph: (1.2, 3.4) or (1,2; 3,4) ? 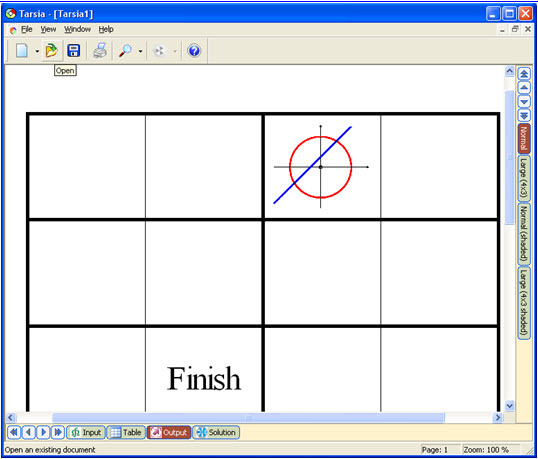 The computer must use the same for ALL applications so that, for example, both Excel and Autograph are expecting the same convention. 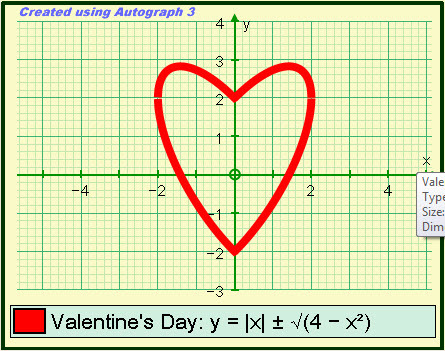 Additionally Autograph uses the List Separator to enter Parametric Equations, eg x = sint, y = cost. Apple and Windows computers treat this topic a little differently. It is also invaluable when using a whiteboard or a walk-about tablet. It is a common request to be able to save axes settings within Autograph. The problem is where would they be stored? You would neeed a personalised preference section, not too difficult for a single user, but tricky to manage in a networked environment. The simple answer is to save a particular Autograph page with the axes just so, then load that file when needed. This short video explains. This video summarises the effect of a matrix transformation on different object types: the unit square, the graph of y = x², and a flag. In each case there is a variable parameter included so that animations can be set up. 3×3 Matrix transformations are also available on a 3D Autograph page. and the slope of the tangent on y = sinx at x = 2a. so at x = 2a, dy/dx = cos2a, a half of the above. An Autograph tip to display the magnitude and direction of a vector [r, θ] that is otherwise displayed only in cartesian coordinates [x. y]. In 2D: draw y = x² – 4 and y = x(3 – x). 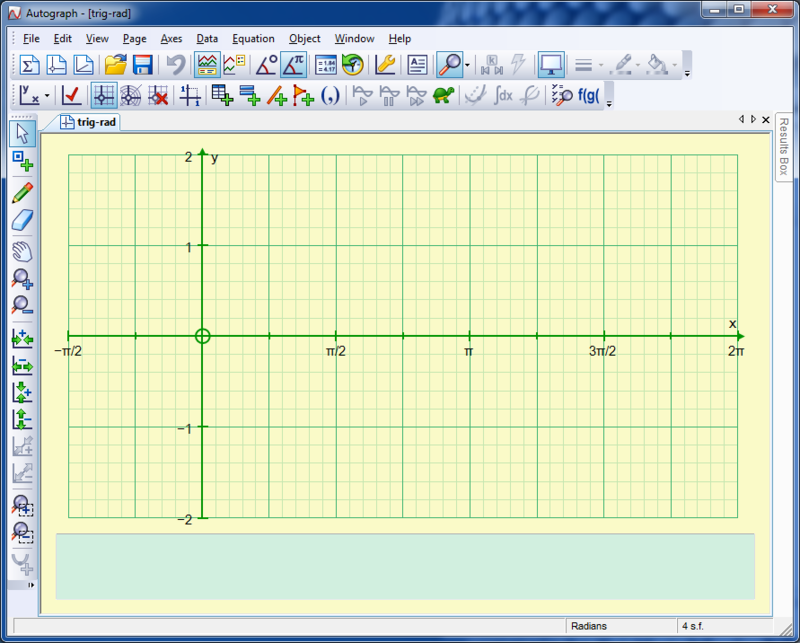 Use Point mode, with CTRL, to locate and mark the two points of intersection. 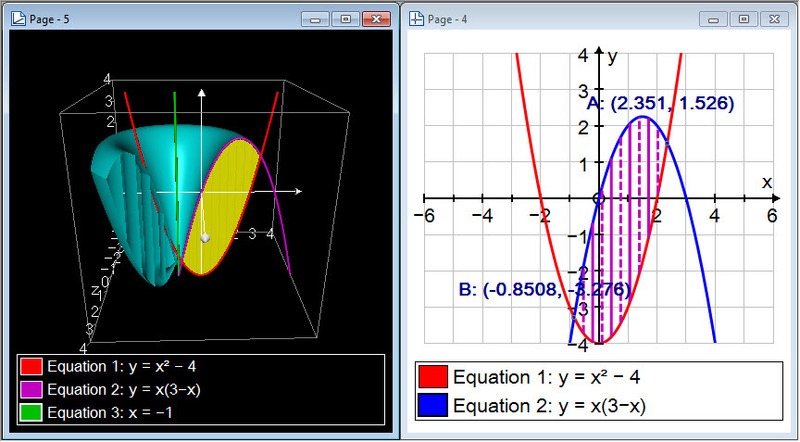 In 3D: draw y = x² – 4 and y = x(3 – x), using the option “plot as 2D”. Select the top graph then the bottom graph, and right-click “Find Area”. Download 2D Autograph File and 3D Autograph file (.agg). Watch Jing video! In “Edit Axes” => “Options” you can control the grid sub-divisions as fractions of π/4. This works well normally, but if you want something special, eg grids of π/6, a good way to do this is to plot the line θ = nπ/6, and then use the constant controller ‘options’ to set up a family of lines. Here I have drawn a family for ‘n’ = 0 to 6 in steps of 1. Note that Autograph conventionally draw’s negative ‘r’ with a dashed line, so under ‘Draw Options’ in the equation entry dialogue, set the drawing to ‘Dashed’ and then get what I have shown here. 14th February is coming up! 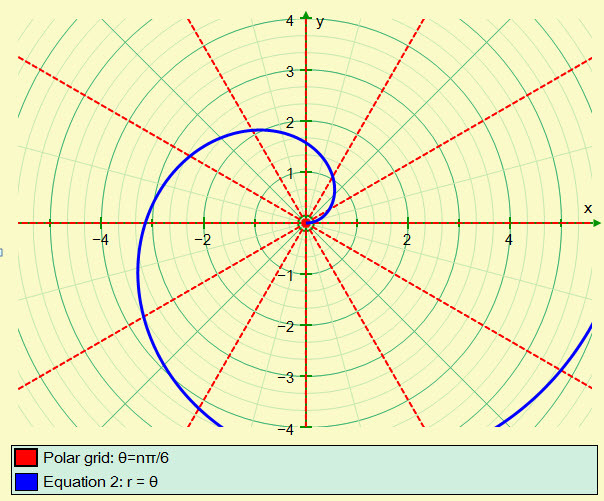 Here is a great exercise in understanding the modulus function and the equation of a circle. Later on, edit the equation (double-click on the graph) , and replace ‘4’ with ‘r²’ and set ‘r’ to be 2, so nothing is changed. Now you can now use the constant controller to set the value of ‘r’ animating from 1.8 to 2.2 in steps of 0.05 … Enjoy!